I always thought the learning process would be slow and steady. We would learn concepts and build on them to have a firm foundation of the basics. My kids would make progress and each day we would cover a new lesson. I tried to plan out my years the summer before with the number of lessons I would complete each week. I thought I was incredibly organized and efficient. Actually, I was very misguided. No one told me that learning is very, very messy! It’s not a linear process. Learning is more of an adventure. You take detours and follow rabbit trails. You review and sometimes you jump ahead to a new concept. If you graphed your child’s learning it would look like a squiggly line that made circles up, down, over, and around the graph. You often take two steps forward and one (or two) steps back. I’ve found that when my kids grasp a concept we sometimes find that the next day we’ve taken a step or two backwards in our learning. The foundation for learning wasn’t quite as solid as I had thought and while it seemed like they understood the concept, I discovered that the previous few concepts were forgotten. Learning requires lots of review, practice, and reteaching. I’ve been known to back up 5 to 10 lessons in our curricula and start all over again when we come to a place where my children are struggling. Sometimes we even repeat the lesson from the day before. Other times I have to add in a few extra review or practice problems before the start of every lesson to make sure that the previous concepts stay solidly in their minds. Sometimes there is a lightbulb moment of understanding. Sometimes we have an exciting moment. My kids suddenly understand a new concept and it’s like a lightbulb goes off in their minds. Then they breeze through the next 10 lessons because somehow we have made connections and they deeply understand the new material. Other times a child seems to lose information that was previously learned. On some days I start teaching a lesson and my child just stares at me with zero comprehension. I ask them questions to see what he remembers from the day before and I’m frustrated to learn that nothing is retained. It’s like we haven’t done any school for the previous week. I’ve given up in trying to plan out my year in advance. I never know exactly how fast we will progress through our lessons. Some weeks we breeze straight through, other weeks we struggle through, and sometimes we have to stop, back up, and start anew. But it’s been encouraging to me to realize and understand that learning is not a linear process. It’s normal for the learning journey to be messy, challenging, and rewarding. Every child will learn at a different pace. You will need to spend time reviewing, reteaching, and practicing while other times you can speed ahead to later lessons. It’s completely unpredictable. And for a momma who likes organization, it has been a tough lesson to learn. 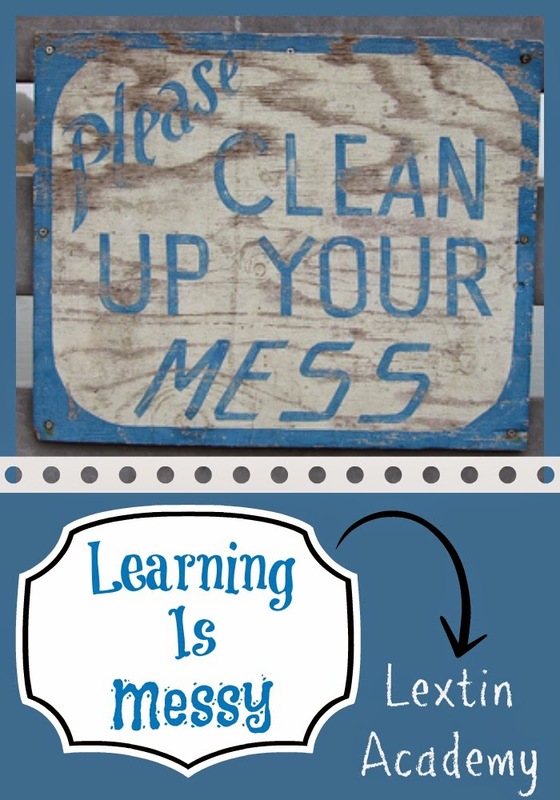 However, I’m thankful that I’m slowly learning to embrace the messy experience of learning.